China Car Times says Volkswagen is aiming to have more than 3,000 dealers in China by 2015. That would expand its dealership network there by about 50 percent. It currently has 1,590 dealers in 30 provinces, as well as Taiwan, selling VW, Audi and Skoda cars. By the time VW achieves this Chinese beigekrieg, it expects to sell 76 different models in China, including vehicles assembled in China and those shipped from elsewhere. VW is the top auto seller in mainland Chinese market with 21 percent, a huge lead over second place General Motors with 10 percent, according to China Car Times. VW is on a push to become the world's biggest carmaker and make Audi the world's biggest luxury brand, and it sounds like China is going to be a huge part of that plan. Meanwhile, if you missed our report yesterday, Audi is expanding its lineup of diesel engines on cars sold in the United States. Audi plans to offer 3.0-liter V6 diesel engines in the A8, A7 and A6 cars and the Q5 crossover beginning next year. The four TDI-equipped vehicles will make their debuts at the Los Angeles Auto Show next week. Audi already offers a diesel in the Q7 crossover, and the 2013 model features an updated engine. The A3 TDI has been dropped but will return with the launch of the redesigned A3 in early 2014. Audi said the diesel models will have 30 percent better fuel economy and lower carbon dioxide emissions than comparable gasoline engines. The A8 diesel goes on sale this spring and the other three models will follow next fall. The Austin-American Statesman reports that while the city's F1 race drew 117,000 fans, the report card for locals' share of the take seems mixed. It will take a while for sales tax and alcohol revenues to be added up, which will tell whether the race generated the $300 million in local business that the organizers promised. Achieving that figure is critical to F1's future in Austin, because race organizers are seeking $25 million annually in tax breaks over the next 10 years. Some of the income looks like a no-brainer. The city hall parking garage, usually free on Sunday, charged $10 for parking, while other garages charged more than double their usual weekend rates. While a few restaurants in the race zone had stellar weekends and brought in extra staff; others farther away declared the F1 experience a bust. Meanwhile, vendors at the track ran short of beer and food during the weekend. "I would say we lost thousands because we ran out of beer," Mika Scott, a Buda resident who was working the beer stand at Turn 1 as a fundraiser for Buda Youth Sports, told the paper. "It was insane we ran out of beer at a Formula One event." New York Magazine reports that private equity kingpin David Bonderman got a special treat for his 70th birthday: Beatle Paul McCartney. Bonderman, a member of the General Motors board, hired McCartney and CCR frontman John Fogerty for a party last weekend in Las Vegas. Fogerty posted a picture of himself with McCartney on his Facebook page. It's the second big birthday in a row when Bonderman pulled a YOLO. His musical guests when he turned 60 were the Rolling Stones, Robin Williams and John Mellencamp. That party cost $7 million, but there's no estimate what the pricetag for this one was. Bonderman, who was once chairman of Continental Airlines, gave guests the option of making a matched charity gift upon arrival at the party, which was held at the Wynn. Of course, the Bonderman bash raises the ante for any other automotive board member who wants to mark a major birthday. 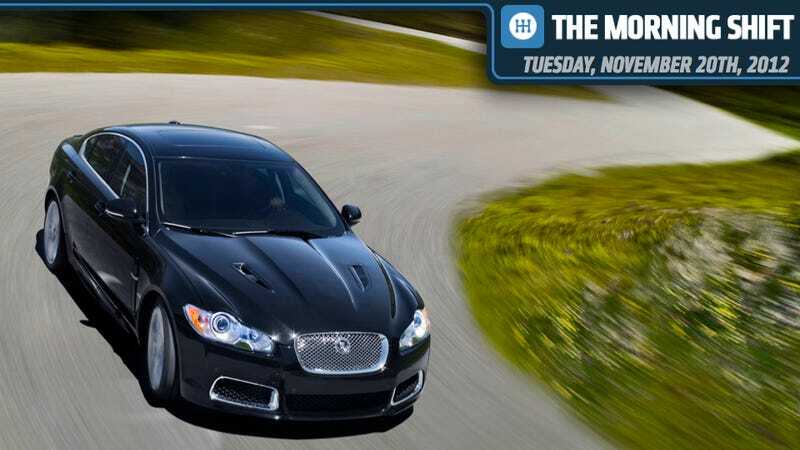 Jaguar today teased the new Jaguar XFR-S, which the company claims will be the fastest and most powerful saloon they've ever built. Faster than an X-Type? Are you sure? No details yet, but the Jaguar XKR-S gets 550 horsepower out of the same 5.0-liter V8 so it's not a bad guess. The XF continues to age, but we're still huge fans of the car and an XFR-S in French Racing Blue is fantastic. Today, we'd like to know your views on Audi's big diesel push. Are diesels a must-have in the luxury car market? Or is this more a fuel economy play? Remember there's no right answer or wrong answer. It's Neutral.